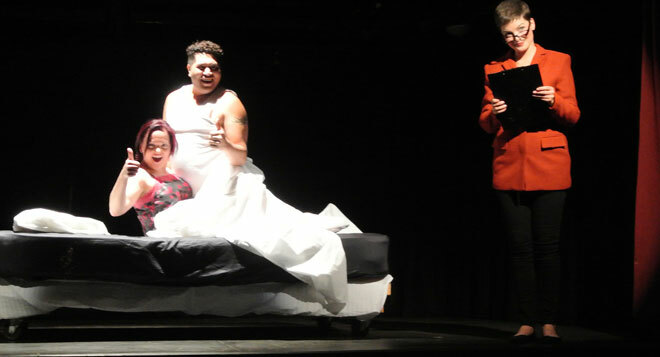 The recognition factor for Totem Theatre’s latest production – the musical comedy, I Love You, You’re Perfect, Now Change – was huge. And with each point of recognition, great bursts of hilarity, as we heard and saw ourselves and those we know as if in a mirror. Are there a set of big scripts in the sky that lay down the lines for the romantic love stories that seem to us, as we live them, so unique? 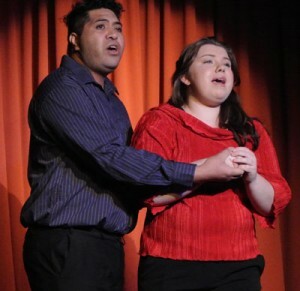 Left: Ben Poona and Maali Kidd sing ‘We had it all’. This was very clever comedic script-writing by Joe DiPietro, set to music by Jimmy Roberts, first produced off-Broadway in New York in 1996, running until 2008. 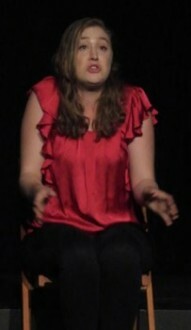 In Alice Springs it was brought to the tiny stage of the Totem by a very able ensemble of six. Between them they handled all the roles in a series of vignettes that playfully trace love’s journey from first date through marriage to child-rearing and old age. The laughs, especially in the first half, were at least one a minute. The second half, as the wide range of characters get older, was often quite poignant, though never downbeat. 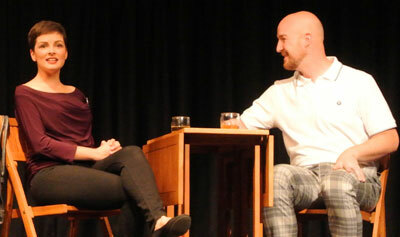 Right: Cicily Svikart and Neil Compton in ‘Men who talk and women who pretend they’re listening’. This was Neil Compton’s second outing with Totem and first time as a director/producer. He was also frequently on stage as one of the two males in the ensemble. The pace, staging, performances were all spot on, so all credit to him. All of the performers demonstrated a terrific versatility, able to play (and sing tunefully) across age groups and character types with apparent ease. Cicily Svikart and Kirryn Wilkinson (at left, in ‘The Very First Dating Video of Rose Ritz’ ) were particularly good in the poignant as well as comic registers. A bonus to the enjoyment was the live musical accompaniment and interludes, handled by musical director/pianist Liese Gordon and violinist Karen Jackson. My only reservation was not being able to see them properly, which I think would be a simple thing to remedy. I Love You, You’re Perfect, Now Change will play at the Totem on Friday and Saturday nights for the next two weeks, ie 20, 21, 27, 28 May, 7pm. Below: ‘Crystal Pollitt’ and Ben Poona in ‘Satisfaction Guaranteed’, with Cicily Svikart as the sexologist.